Dragonflies are insects which date back to before the days of the dinosaurs. Over 300 million years ago dragonflies with wing spans of three quarters of a metre flew in the sky above rivers and wetland. Today dragonflies and their smaller relatives damselfies, can be found around many unpolluted aquatic fresh water habitats. In Britain there are about 44 species. Most of these are resident although there are some migratory species. They usually colonise slightly different niches or emerge at different times of the year.
. 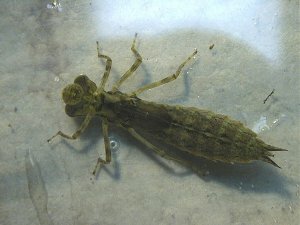 The carnivorous aquatic larva live in the water for up to 5 years depending on the conditions and the species. The larva are predatory and feature a specially adapted hinged lower jaw which can shoot forward and grab prey. (Pic. Southern Hawker larva). 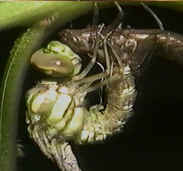 Before the adult dragonfly emerges the larva crawls out of the water usually on a plant stem. It does not pupate and emerges as an adult. They then leave the area and feed on insects. They return to the water to breed. The males of nearly all the species are fiercely territorial. They can easily be observed on warm summer days guarding their territory and catching insects with their powerful jaws. (Pic. Southern Hawker emerging at night). The females which are usually not so colourful only return when they are ready to breed. Depending on the species they may lay their eggs on the water, in mud or on the stems of aquatic plants. Sometimes, as in the case of the Southern Hawker the eggs can be laid on rotting wood on the bank. Adults live for approximately six weeks. 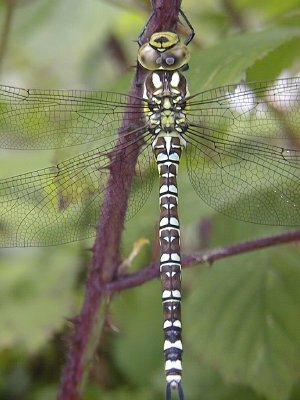 Although because different species emerge at different times it is possible to see dragonflies and damselfies from May through to December in mild years.